Have you ever bought a game based on nothing but the title? I sure have and that’s why I’m now writing about Jesus: Ky?fu no Bio Monster (or to use the fan-translated name – Jesus: Tale of the Dreadful Bio-Monster). Don’t go into Jesus expecting some kind of insane Japanese take on Christianity, though, as it’s more about researchers fighting space monsters and anime girls rocking out on synthesizers – or sometimes both at the same time. It’s hardly the most exciting game to play, but it still manages to be crazy in its own way. There are some conflicting sources out there on who created Jesus. Some people claim it was Enix, others say it was Chunsoft. A few people don’t get that I was asking about a video game and tell me it was the son of God, but I don’t really know what that’s about. The game was originally released for the PC-8801 computer back in 1987, but the later Nintendo Famicom port in 1989 was the first version to sport the “Tale of the Dreadful Bio-Monster” subtitle. All of the versions are essentially the same, but I’ll be focusing on the Nintendo port because I already own it, it’s the only one with an English translation and, well, just look at the name of the website you’re reading. So what genre of videojuego is Jesus? Well, it’s a text-heavy mix of a visual novel and adventure game where all the interaction occurs through selecting commands from a menu. It’s very similar to Yuji Horii’s iconic Portopia Serial Murder Case, though despite being developed by some of Horii’s fellow Enix employees, it doesn’t appear that he was involved with Jesus at all. Instead, the game was created by a small team that included programmer Takanari Suzuki and Shintaro Majima, who is now president of Artepiazza and developed several remakes of Enix’s Dragon Quest games as well as original titles like the quirky Opoona. Curiously, the game was written by puzzle creator, Koji Miya, who, as far as I’m aware, is more of a real-life Professor Layton than a game designer. To me, the most striking thing about Jesus: Tale of the Dreadful Bio-Monster (at least after the name) is the game’s art. Just look at this cartridge! 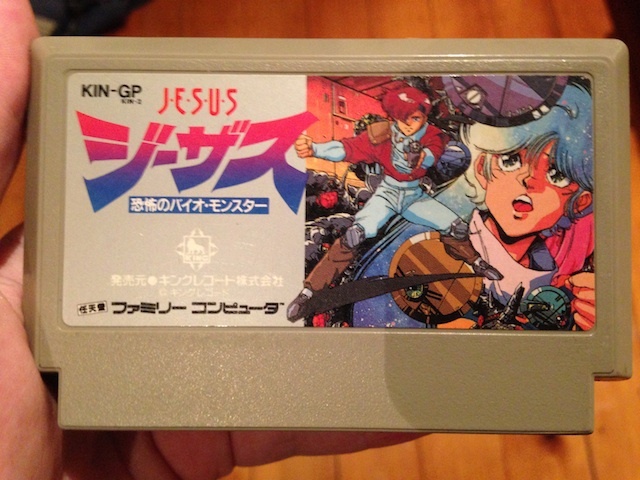 I’m a total sucker for that mid ‘80s sci-fi anime look and Jesus pulls it off very well. Yes, the actual in-game graphics don’t look nearly as detailed as the cartridge art or even the original PC-88 version, but Majima’s colourful environments and expressive characters are a significant leap over similar games like Portopia and Shadowgate. In the distant future, a team of soldiers and researchers are dispatched to Halley’s Comet to investigate potential signs of life. The name of their space station? Well it’s “Jesus”, of course. The story follows Hayao Musou, an eighteen-year-old member of the research team and avid gamer. The game is divided into three acts. Despite the title, only the first section actually takes place on Jesus and serves as a way to introduce the multiracial cast aboard the station by having Hayao run around handing out ID cards. Among the supporting characters are piano prodigy and Hayao’s girlfriend, Helene and her “mascot robot” (read: R2D2 rip-off) FOJY. Yes, FOJY is just the word ENIX moved up one character in the alphabet. After the tedious task of running around Jesus and hoping you trigger the right flags to actually give out the ID cards, Hayao and FOJY are sent to board the spacecraft harvesting gas from Halley’s Comet (which is confusingly also called the “Comet”). Here the game takes on a more open-ended feel – or at least pretends to. There’s a great sense of isolation that comes with walking around the deserted (and quite confusing) halls of the ship alongside your robot buddy, especially when you end up running into some kind of dreadful bio-monster. Unfortunately, these encounters lose any sense of tension when you realize that Hayao can’t actually die. Instead, fighting off aliens relies on nothing but trial and error. There’s a stash of weapons hidden somewhere on the Comet and you’d better hope that you picked up the correct one along the way. Choose the wrong tool for the job and Hayao retreats, meaning you have to search for another weapon and hope you’ve made the right choice this time. This is Jesus’ biggest flaw – while it gives the illusion of freedom, the game is actually completely linear – you have to do exactly what the game wants you to in the exact order, even when it doesn’t make much sense. To be fair, this is a common issue with the genre (even my beloved Phoenix Wright games often fall into this trap), but Jesus takes it to egregious levels by offering very little explanation for what exactly you’re supposed to be doing. For example, there are plenty of instances where you need to examine areas multiple times in order to advance the plot – even if there’s no indication that anything is there. Perhaps publisher King Records just wanted people to buy the strategy guide. After a tedious trek through the Comet discovering dead bodies and searching for various keycards (ironic, considering the first part of the game), Hayao finds Helene and heads to another ship – the Corona. It’s this final part of the game where Jesus throws away any attempt at engaging gameplay and focuses on what really matters – delivering an utterly insane storyline. So Hayao brings back a sample of the monster’s body which quickly disappears. Yes, the monster has regenerated itself and proceeds to rampage around the ship killing just about the entire crew. Hayao, FOJY and Helene manage to escape, thanks to, of all things, a cassette tape (hey, maybe we use cassette tapes in the future) of Helene’s kickin’ synthpop scaring off the monster. Turns out the monster has been stealing DNA from the crew and uses this to evolve into stronger forms because sure. It can also speak in all of the languages used by its victims at the same time since that’s apparently how language acquisition works in anime land. FOJY finally does something worthwhile and translates the creature’s speech, which Hayao uses to try to negotiate with it. As you’d expect, the negotiations don’t exactly work, but they help uncover the monster’s motive – it hitched a ride on the comet (Halley’s Comet, not the Comet) and wants to conquer Earth. A long, drawn-out pop quiz from FOJY leads the characters to deduce that the monster is weak to music. And so, the game remembers that Helene still exists and the day is saved by her impromptu synthesizer jam session. Her tight tunes cause the monster to let out screams, which FOJY translates as your dead friend’s comments. Suddenly their combined consciousnesses are able to control the monster and send it packing for the far reaches of space. Thank you, Jesus. Hayao and Helene comfort each other, spending so long snuggling that they forget about FOJY, who promptly runs out of power and loses his memory. Oh well. Koichi Sugiyama handled the game’s soundtrack, with an excellent main theme sounds very similar to his work on the Dragon Quest series (and with the number of times it plays in-game it’d better be excellent). The environmental noise? Not so much. A constant droning noise and the beeping of computers accompany Hayao as he explores the Comet. These initially give a great feeling of tension, but quickly become annoying. There are also a couple of hilarious moments where overly cheerful music doesn’t match the tone of the game at all, such as when characters are being killed off. Like in the Phoenix Wright games, chirpy sound plays as people speak, with different sounds creating different voices for the characters. It’s a neat effect, but because the Famicom only has a few sound channels it ends up causing parts of the background music to drop out. There was actually a second coming of Jesus; a sequel for the PC-98 computer was eventually released in 1991. I can’t vouch for whether it lives up to the same “quality” as the original title, but it continues the story with a different cast. Jesus might not exactly live up to its ridiculous title, but I still can’t hate on it too much. The premise is essentially an unoriginal mix of Macross and Alien – a combination of goofy anime and sci-fi horror that comes off as more than a little bit hokey. What little gameplay there is consists of trial and error that serves to artificially stretch out the game’s length. The presentation is dated, the soundtrack is repetitive, yet the game’s very existence is something I find endlessly entertaining. Make no mistake, Jesus is most definitely a Bad Game, but it really needs to be experienced (with a guide). As a game that consists of nothing but text, there’s not much point playing Jesus if you can’t read any of it. There aren’t any kanji characters and it’s all clearly written with a younger audience in mind, but your best bet is to use the fan translation by Niahak (thanks so much for the manual translations!). It was recently retranslated with a more comprehensive and cohesive script, but the original version (which all of the images here are from) has a certain earnest simplicity to it that makes the game far more entertaining, even if it doesn’t help with the confusing directions. And really, there isn’t much reason to play Jesus outside of its bizarre charm. Next time on Famicompendium, I’ll be taking a look at a far more recent Nintendo DS title. I’m not saying it’s a game I love, but it should be relevant to the day it’s posted so that’s a plus.